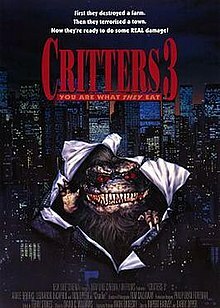 Critters 3 is a 1991 American science fiction comedy horror film and is the third installment of the Critters series, directed by Kristine Peterson, and is also Leonardo DiCaprio's film debut. Cary Elwes mentioned on the commentary for the uncut edition DVD of Saw that he passed on the role of Josh. It was shot simultaneously (from February 1991 until July 1991) with its sequel, Critters 4. Unlike the first two films, it does not take place in the town of Grover's Bend. Sometime after the events in Critters 2: The Main Course, Charlie MacFadden is tracking down the last of the Critters. A family of three – Annie (the main protagonist), Johnny (her little brother) and Clifford (the father) – stops at a rest stop when their car's tire pops. At the rest stop, Charlie warns them and Josh, stepson of a corrupt landlord, about the Critters. As this happens, a Critter lays eggs under the family's car and the family leaves, unknowingly taking the eggs with them. Soon after they arrive at their tenement, the Critters hatch and attack the sleazy maintenance man, Frank. When the landlord arrives, he too is eaten by the Critters after Josh locks him in Clifford's room, unknowingly trapping his stepfather with the creatures. Next, one of the residents is attacked and wounded. Annie, her family and five others (including Josh) try to get to safety in one piece by getting to the roof of the building. Charlie arrives and destroys the remaining Critters, saving the remaining tenants. The film ends in a cliffhanger as Charlie is about to destroy two Critter eggs, but is ordered not to and a containment pod sent from the Intergalactic Council crashes into the basement. The film was released direct to video in the United States by New Line Home Video on December 11, 1991. In 2003, New Line Home Entertainment released it on DVD. The film was re-released in a set containing all 4 Critters films on DVD by Warner Bros. in 2010. This was Leonardo DiCaprio's first ever film role. On July 20, 2018, it was officially announced that the all four films will receive their first-ever Blu-ray release. Scream Factory, a subsidiary of Shout! Factory will release the films as part of "The Critters Collection". The set will be available from November 27, 2018.
Review aggregation website Rotten Tomatoes gives the film an approval rating of 0%, based on reviews from 6 critics, with an average rating of 2.8/10. ^ "Shout Factory: Fourteen New Titles Coming Soon to Blu-ray". Blu-ray.com. 20 July 2018. Retrieved 29 July 2018. ^ "Critters 3 (1991)". Rotten Tomatoes. Fandango. Retrieved 23 September 2017. This page was last edited on 16 April 2019, at 01:30 (UTC).